How to get there: We climbed this peak together with Mount Shavano, see this entry for more information. Route description: Only the route from the summit of Mount Shavano will be described. This route follows the north-west ridge of Mount Shavano, descending 162 vertical meters to the saddle between Shavano and Tabeguache. At the time of our hike this ridge was rocky with some new snow (the night before). The climb from the saddle to Tabeguache was a straightforward snow slope ending in a nice little snow ridge (going left) to the summit. It took us one hour to hike from Shavano to Tabeguache, 45 minutes on the return. This difference (despite more vertical on the return) is likely due to the easy going down the snow slope from Tabeguache. Comments: I did this hike with my son Pål Jørgen, age 12. The weather was beautiful and we spent 45 minutes on the summit of Tabeguache. The peak looks rather mundane from Shavano, but it has merit, the views were perhaps even nicer from here than from Mount Shavano. 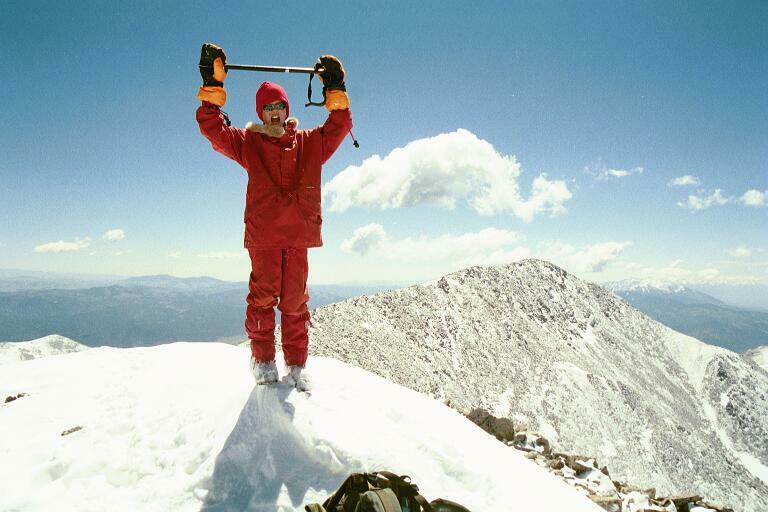 On the summit of Tabeguache Peak, Mount Shavano behind.